PlayUnknown BattleGround players Maybe interested in a new official Xbox PUBG Greaseproof Controller to celebrate the launch of PUBG on Xbox One. Check out the promo video below which has been created for the PR stunt to celebrate the launch playing on PUBG’s “winner winner chicken dinner” slogan which appears to winners at the end of a game. 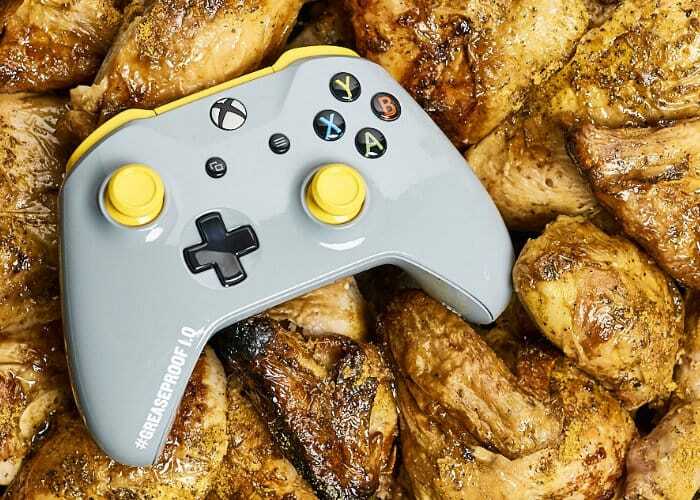 The controller has been finished with a “patented coating that is resistance to chicken grease – assisting players in their fight for elusive, yet tasty, chicken dinner victories”. “It’s time to say goodbye to the greasy fingers of yesterday and hello to the sweet victory of tomorrow: no longer will chicken dinners slip through a player’s fingers, as Xbox Australia has created the limited edition PLAYERUNKNOWN’S BATTLEGROUNDS Greaseproof Controller! Created to celebrate the graduation of the game from Xbox Game Preview to full release (out now) and as a nod to the fan favourite “WINNER WINNER CHICKEN DINNER!” phrase, the controller features a patented coating that is resistant to chicken grease – assisting players in their fight for elusive, yet tasty, chicken dinner victories. For more information on how to score yourself a Greaseproof controller visit Xbox ANZ Facebook page.